Michael is extremely smart, engaging, pleasant, polite and curious about the world around him. He asks a lot of questions and is very observant of his environment. 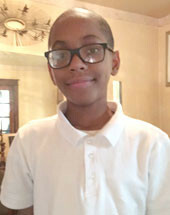 He enjoys swimming, playing his handheld video game, drawing, playing Basketball and reading (when he is interested in the subject). He is loving and approachable. He likes meeting new people and is open in his interactions with others. Michael played Basketball for his school team at one time. Now Michael is on the Swim Team. He loves to carry out from Subway and Chick-Fil-A restaurants. Other favorite foods are pizza and Buffalo wings. Michael is in the fourth grade and his favorite subject is Math. Michael needs to be adopted by a family who is willing to be patient and supportive enough to provide stability throughout his developing years.